Sanctuary Wheelchair Access Walk-In Tubs provide easy access for wheelchair users and others who need a little extra room to get in and out of the the walk-in tub's seat. Wheelchair Access tubs achieve this by providing large doors that reveal the profile of the seat. 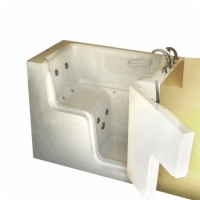 In all other ways, the Wheelchair Access tubs provide the same build quality and optional luxury features such as whirlpool and air jet systems.